I don't know about other parts of the country, but we've been enjoying beautiful 70 degree weather here in Texas lately. It's a welcome change to the all the ice and snow we've been having! (Makes me wish we had a yard with a wooden swing set for my little girl to play on, though.) While some desserts lend themselves to the winter season (i.e. Yule log), here are two sweets that can be enjoyed year round whether it's warm or cold outside - panna cotta and florentine cookies. 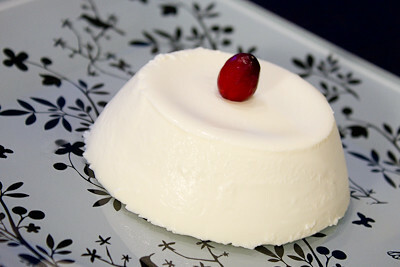 I love panna cotta and have always wanted to try making it. Every time I see it on a blog, I think I should try it, yet I never seem to get around to doing so. I was glad, then, to see that it was chosen for this month's challenge. Panna cotta is an Italian dessert made by simmering together milk, cream, and sugar, mixed with gelatin. When set, it has a texture/consistency somewhat thicker than flan and but more delicate than jello. Giada's recipe uses honey in addition to sugar to sweeten the cream. I found that this was a great way to flavor the panna cotta. It was subtle, but added some depth to the panna cotta's flavor profile. It only took a year, but I took this opportunity to use some Bee Raw wild raspberry honey that I won from Blake Makes. 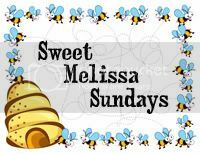 Because honey always takes on the flavors of the flowers used by the bees during the pollination process, this is “a light and floral honey, with a unique raspberry finish intertwined with the aroma of warm cocoa butter." It was wonderful in this panna cotta. I ended up serving my panna cotta in several different ways. I layered it with some strawberry gelée in a small drinking glass, put it in some mini dessert glasses, and unmolded one from a small ramekin. 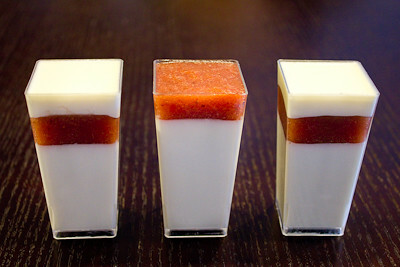 While the small drinking glass size is great for any panna cotta lover, I think it's way too much cream for most folks. The small ramekin size was good and would probably be the size I would go with for entertaining. The mini dessert size was my favorite, though. Just enough to get a taste when you're craving something sweet after dinner, but not too much to where you end up too full and wishing you hadn't had dessert. If you've never made panna cotta before, I encourage you to try it. It is really easy and doesn't require a lot of ingredients. You can dress it up for a holiday or special occasion, or enjoy it with a weeknight dinner. The florentine cookies were my favorite part of this challenge! They reminded me quite a bit of the maple tuiles I made not long ago, with a more grainy texture due to the addition of oats. These did not last long in our household, as I kept telling myself they were healthier for me than regular cookies because of the oats ;) I drizzled some with chocolate, sandwiched some cookies with nutella, and then ate the rest just plain. They were good and I will definitely be making them again! Thanks Mallory, for hosting this month's challenge. I'm glad I finally got to make my own panna cotta, and I'm thrilled to have discovered florentine cookies! Make sure you check out the Daring Bakers' Blogroll to see how everyone else enjoyed these sweet, creamy, and crunchy treats! 1. Pour the milk into a bowl or pot and sprinkle gelatin evenly and thinly over the milk (make sure the bowl/pot is cold by placing the bowl/pot in the refrigerator for a few minutes before you start making the Panna Cotta). Let stand for 5 minutes to soften the gelatin. 2. Pour the milk into the saucepan/pot and place over medium heat on the stove. Heat this mixture until it is hot, but not boiling, about five minutes. (I whisk it a few times at this stage). 3. Next, add the cream, honey, sugar, and pinch of salt. Making sure the mixture doesn't boil, continue to heat and stir occasionally until the sugar and honey have dissolved 5-7 minutes. 4. Remove from heat, allow it to sit for a few minutes to cool slightly. Then pour into the glass or ramekin. 5. Refrigerate at least 6 hours or overnight. Add garnishes and serve. - When you sprinkle your gelatin over your milk, be sure that it's a thin even layer of gelatin, no clumps. When you heat it up after it's soaked a bit, you'll be less likely to get any lumps of gelatin in the finished product. - The type of honey you use will lend a subtle flavor the panna cotta so if you have a particular non-clover honey that you enjoy, you should use it in this recipe. - If you cannot find powdered gelatin/only have access to sheet gelatin this can be used. Simply follow the directions on the package for conversions. - Milk substitutes, such as skim, almond, or even coconut milk can be used in the vanilla Panna Cotta in place of the whole milk, but cream is important. In order to get the right texture there needs be a certain percentage of cream fat. 1 cup (240 ml) (230 gm) (8 oz) fruit (strawberries, raspberries, mango, blackberry, etc.) *Note: Certain fruits interact with gelatin and stop it gelling like pineapple and kiwi etc. 1. Sprinkle gelatin over water. 2. Place fruit and sugar in a small saucepan and simmer until sugar has dissolved. Now mix the gelatin into the strawberry mixture and stir until gelatin has dissolved. 3. Remove from heat and allow to cool (close to room temp, again, if you're planning on layering on pouring on top of your Panna Cotta, a hot mixture will also heat up your chilled Panna Cotta). - If you only have old fashioned oats on hand, simply give them a quick whir in your food processor to give them a similar texture to the quick oats. If you don't have a food processor on hand, you can still use the old fashioned oats in this recipe, you'll just end up with a chewier cookie. - Nutella also tastes great sandwiched between these cookies! Yum! These look and sound delicious. I love the tall square glasses you used! So pretty. The raspberry honey sounds like it would have added a really lovely, but subtle flavour to the dessert. Great job on the challenge! Looking good Jamie!!! loved those litle cups with the panacotta and the florentines...Great photos! OMG! Gorgeous! Very impressive and I love your square minis - stunning. I have not made panna cotta before, but this is sure inspiring. On a separate note, I didnt know you were in TX... me too. 76 and gorgeous here today. Have a great week! Boy do yo know how to take a challenge and blow it out of the water. This looks amazing. Oh wow your pannacottas look lovely :), they look so pretty & i bet they tasted delicious! Awesome presentation Jaime. I love that plate too!! 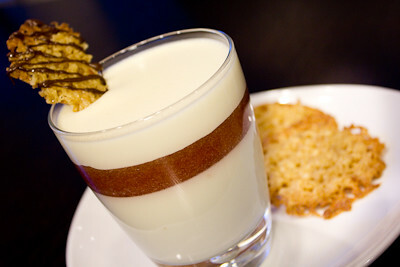 The panna cotta looks delicious, I wish I had some!